Brrrrr…Is It Getting Colder In Here? The popular Anna and Elsa dresses that are found at the Walt Disney World Resort. The Disney Store has released an update regarding Frozen merchandise and let’s just say that the product shortage is far from being over. Per the statement located on the Disney Store’s website, Frozen products will go on sale as soon as shipments arrive to their stores; with dresses and dolls being the exception. These popular items will be sold ONLY on Saturday mornings during store openings. 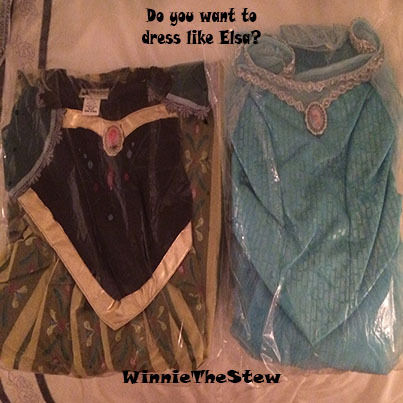 Here is where things get really crazy…the Elsa dresses will be sold via a lottery. Guests waiting in line on Saturday mornings will be talked through the process by a cast member and their names will be placed into a lottery drawing. The drawings will be held per dress size and guests can only enter their names into one drawing. Please note: There is a 2 Frozen item per guest limit for certain merchandise; however the Elsa dresses will be limited to 1 per customer both online and in stores. Disney also stated that more merchandise will be available in July and August. Wow, that’s a long wait! Follow The Disney Store on Facebook and Twitter. If you see one of those Tweets, drop everything and immediately go to the Disney Store’s website. The Elsa dresses sell out in mere minutes. To double your chances, have a family member also monitor The Disney Store’s Tweets who can log in quickly and purchase a dress. Do you have a friend or friend of a friend making a trip to Walt Disney World or Disneyland? Ask them to pick up a dress for you while they are vacationing. The dresses are stocked more frequently in the parks and cast members have been terrific about giving advice on what stores may have the dresses on site. Think warm thoughts. It’s almost Summertime and hopefully this wintery merchandise freeze will all be over soon.